As the communities of Prattville and Wetumpka grew, we reached out to include them as part of our family of readers and editorial coverage. Once again we find ourselves changing to reflect the world we live in recognizing our community has blended with others in central Alabama. In order to reflect the expanded reach we’ve changed our name to ALMetro360 — The Premier Lifestyle Magazine for the Heart of Alabama. The name really says it all. ALMetro360 is branching out to more communities including Auburn, Opelika, Pike Road, and the lake region. Adding these locales to our old footprint of Montgomery, Prattville, Millbrook and Wetumpka provides our advertisers — who make this magazine possible — with bigger and better opportunities. Auburn and Opelika are not only growing in numbers but in significance to our region in terms of education, culture, and overall vitality. The goal of ALMetro360 is to connect all of the thriving communities in a meaningful way. As a reader, you will benefit from expanded editorial coverage of the region’s people, businesses, happenings, dining, real estate and healthcare and more. In addition to the magazine — which has been redesigned for your reading pleasure — you can enjoy the benefits of an all new Website. You’ll see expanded coverage and exclusive content and benefit from timely additions including places to go, events, advertiser savings, and more. 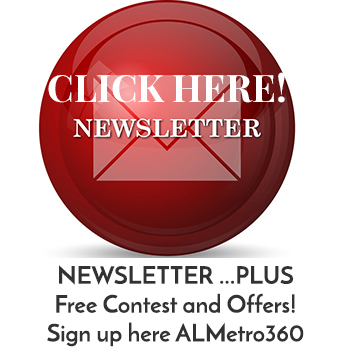 Plus, here on ALMetro360.com signup for our free newsletter. In doing so you will automatically be entered to win in any and all of our give-aways by participating advertisers. The newsletter will be timely, informative and fun to read. You’ll be on top of what’s happening, where to dine, the latest fashions, delicious recipes, healthy living tips and much, much more. Thank you for being a part of ALMetro360. You’ll see there’s not a single sacrifice on quality… just more and better opportunities for you to enjoy the world around you. We hope that you’ll make your magazine and ALMetro360.com a regular part of your routine as well. Let us know what you think. We look forward to continuing to serve you.